Prime Minister Sheikh Hasina said her government is firmly committed to protect the rights of religious minorities and always encourages dialogue between different faiths. 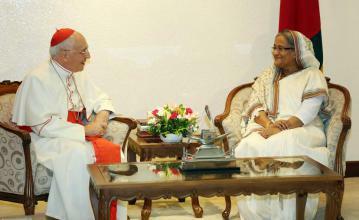 She said Bangladesh deeply values the relations with the Holy See (Vatican) and is committed to further strengthen the close ties existing between the two countries. The Prime Minister said this when visiting Senior Cabinet Minister of Vatican Cardinal Fernando Filoni made a courtesy call on her at her Tejgaon office here today. Sheikh Hasina said religious harmony is prevailing in Bangladesh and the government is committed to protect the rights of religious minorities. The Vatican Minister appreciated the peaceful coexistence of the people belonging to different religions in Bangladesh and praised the prime minister's role in maintaining the harmony. He said the Catholic community is very small in size but he is overwhelmed at the wonderful peaceful coexistence and good understanding between one and the others. The Vatican minister said he is enjoying his first visit to Bangladesh and he is amazed seeing the natural beauty of the country. The prime minister appreciated the constructive and significant role played by the Catholic community in Bangladesh particularly their involvement in various social services including in the health and education sector. The prime minister through the cabinet minister invited Pope Francis to visit Bangladesh. PM's advisor on International Affairs Dr Gowher Rizvi, Vatican Ambassador to Dhaka Archbishop George Kocherry, president of Catholic Bishops in Bangladesh Archbishop Patric D'Rozario and PMO secretary Suraiya Begum were present on the occassion.